Color(s): Brindle, blue, and wheaten. The Glen of Imaal Terrier breed is also known as ‘Irish Glen of Imaal Terrier’ and ‘Wicklow Terrier’ because of its origin being County Wicklow in Ireland. It is believed that this breed came in to existence during the rule of Queen Elizabeth I when she hired French and Hessian soldiers to stop the civil unrest in Ireland who then settled down in Wicklow area. They developed Glen of Imaal Terrier by crossing their low-slung hounds with the local terrier stock. This breed was used mainly to get rid of vermin from the farm as well as home and for hunting purposes. It is also believed that they were used as a turnspit dog and was used to turn spits of meat over the fire for cooking. This was the first recognized in 1934 by the Irish Kennel Club and most recently recognized (2004) by the American Kennel Club. 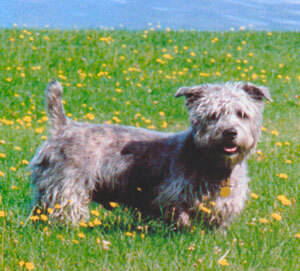 Glen of Imaal Terrier may live for 15 years or more and because of the breed being rare, there is no known health problems associated with them. However, they may occasionally suffer from skin allergies.